It was either Wolfgang or California Pizza Kitchen that first put a BBQ Chicken Pizza on the menu and it's something that I have been eating since I was a kid. It's one of those flavor combinations that I probably never would have thought of on my own, but am so glad that someone else did. 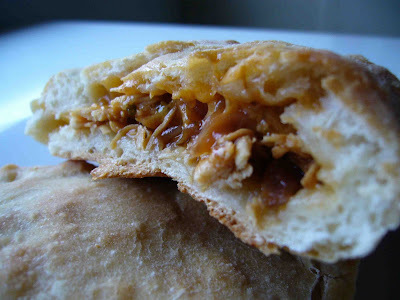 When you bite into this calzone the sweetness of the BBQ sauce and caramelized red onions plays perfectly off the savory nature of the pizza. Dip the pizza in some cool ranch dressing and it's heaven. My Italian neighbor thinks it's blasphemy to utter the words pizza and ranch dressing in the same sentence. What do you think? Slice the onion thinly. Heat the canola oil in a medium pan over medium heat and add the onions. Saute until caramelized and let cool slightly. Divide pizza dough in two and form into flattened round discs. Let rest while you prepare the filling. Combine the chicken, chopped cilantro, cheese and onion in a small bowl. Roll each disc of pizza dough out into a 10" circle (no points for perfection here - anything close will do). Mound half of the filling on one side of each disc and fold remaining half over the filling. Seal the calzones by folding the edges up and pressing down lightly. Press edges down with a fork to ensure a tight seal and use fork to poke a few venting holes in the top of each calzone to release steam. Bake for 24 - 26 minutes until golden brown. Enjoy! Hey there! THanks for the chocolate malted cupcake idea. I have always been a sucker for a chocolate malt so these sound incredible!!! Do you mind if I borrow one of your photos and post a link to your recipe when I do my cupcake post in a few weeks? Wow, we love doing calzones, and are always looking for new filling ideas. Another interesting twist would be to do this on a BBQ grill...hrm, I wonder...I'll let you know if we try it! P.s. I *used* to have a serious addiction to eating ranch with my pizza, now I like to pretend I can take or leave it...but I definitely still love it!